Those of us that have been enjoying ITV's Sunday night drama Vanity Fair (or that read it many years ago!) are already familiar with the fabulous Becky Sharp. 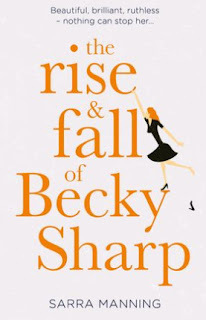 Sarra Manning's decision to reimagine the story of Vanity Fair in a contemporary world is a great one as Becky is surely one of the most captivating, amusing and completely irrepressible characters in fiction and a wonderful protagonist to play with. In this novel, Manning retains the wit, humour and drama from the classic novel and by transporting it into a modern setting, she has created a book which is lighthearted, entertaining and very enjoyable! The story begins at the final of the Big Brother house with Becky and Amelia as the last remaining contestants. Who will it be? Amelia the 'posh totty who's been unlucky in love but become the princess of the nation's hearts' or Becky the 'care assistant with the big heart and wicked sense of humour'? Beautifully updated to their modern day roles, Amelia and Becky's friendship is sealed, Becky already manipulating the unsuspecting and naive Amelia as they leave the confines of the house and face the mercy of the general public. From the outset of the novel, Becky's calculating personality is revealed as she widens her eyes, bites her bottom lip and positions herself carefully in front of one of the 80 cameras spying on her trying to capture her 'real' self - which they will never do. Alas, Becky is not the winner and is cast into Amelia's shadow as the runner up, but this is Becky Sharp and we all know that is not going to stop her from finding the limelight. The Guardian have labelled her as 'this summer's most unlikely feminist icon' and she is determined not to be remembered for her white bikini and her contrived confrontations in the Big Brother house but 'gorge on the it all: fame, power, success' until 'everyone remembered her name'. I loved the updating of this story - it's clever, imaginative and very funny. Manning completely captures the core essence of Becky and her use of modern day references are so apt and so appropriate that I found myself nodding with respect for her creativity and repositioning of the main characters within contemporary society. As with the original story, Manning's version gallops along at a rapid pace and introduces us to the wide range of characters, locations and adventures. The writing is fluent, well judged and action packed with great dialogue that really lifts the characters from the page and a style that is engaging and engrossing. I don't really want to repeat the plot because actually that would spoil it for anyone - whether you are familiar with the original classic or not, Manning's version feels fresh and full of vitality. I also don't want to spoil the references, updated context, twists and traumas as that would also spoil it for any reader. I think really all I want to say is that this is a lovely, fun, upbeat read with a protagonist that will fascinate, horrify, entertain and shock you. Manning's fluent and accessible prose makes the story fly off the page, pulling the reader by the hand along with Becky as she continues her quest for success, fame and money. While reading this book I was struck with how resonant the issues in Vanity Fair remain today and whether you know the original classic or not, this is still a book worth reading because of this. Becky Sharp is not always likeable (as with several of the other characters who are all flawed) but there is something about her that makes us want to see her champion. She's manipulative and audacious - she can also be charming and seemingly kind although one is never really sure what is real with Becky, but there is always something that makes us want to see how her story plays out. Dedicated to William Makepeace Thackery who created these wonderful characters that I got to play with. I hope that he would approve. Yes, they are wonderful characters, yes Manning has had fun playing with them. And yes, I really think he would approve! In a world full of celebrity, social media fame and facade, The Rise and Fall of Becky Sharp is a timely novel and definitely the perfect weekend or holiday read. A well paced, humorous and engaging novel. The Rise and Fall of Becky Sharp was published by Harper Collins in Sept 2018. My thanks to the publisher and NetGalley for the advance copy.